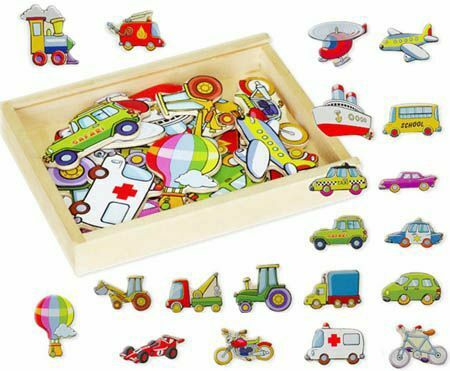 Magnetic Wooden Vehicle Shapes is a box filled with all sorts of methods of transport. All these cars, trucks, planes, buses... and many more can all be lined up and played with on the fridge or any metal surface. This is a great toy to help with learning names and making up stories as you drive them all over the place. There are enough different types of vehicles here to start your own transport company. Material: Wood with a Perspex lid. Magnet. Gloss wipe clean surface. We like this because: "Its fun driving and flying them around the fridge door."